I would like a standard Approval process to a document library to be started automatically when a new item is checked in. The approver of the item should be the "Product Manager" and this info is provided with the current item. So, I have copied a standard Approval workflow for SharePoint 2010 and the idea was to modify this. After modification in SharePoint Designer I am able to send a customized mail to the approver, using [%Current Item:Product Manager%]. But I suspect I also need to assign a task to this person, otherwise no approval will be done. There is a [%Task Process:Participant List%] that looks interesting, but I do not know where to change that. 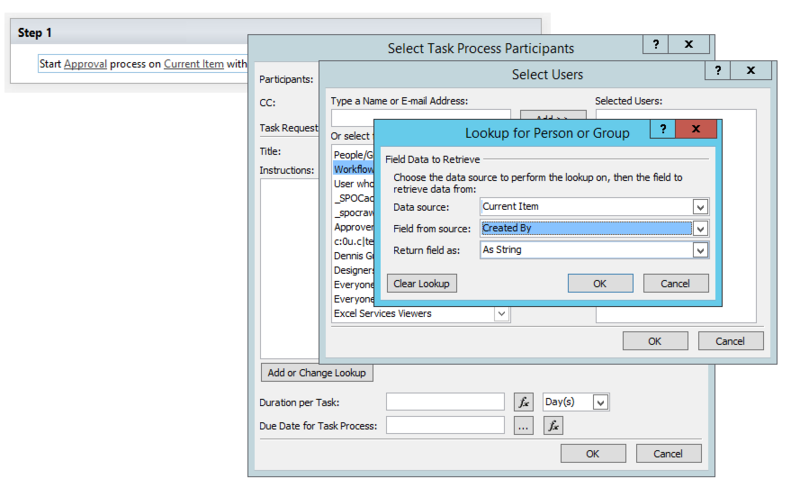 From your description, you want to assign task to the people in the People Column of the list item using SharePoint 2010 workflow. It is not necessary to change the Email "To" to [%Current Item:Product Manager%] and assign a task to this person in "Change the behavior of a single task" and "Change the behavior of the overall task process". If the workflow is triggered, it will assign a task to the [%Current Item:Product Manager%], and send an email to him about this. Not the answer you're looking for? Browse other questions tagged sharepoint-online designer-workflow approval-process or ask your own question.